Orlando Lamar Pace was born on 4 November 1975, in Sandusky, Ohio USA, and is a former professional American Football player, best known as an offensive tackle for the St. Louis Rams in the National Football League (NFL). So just how loaded is Orlando Pace now? Sources state that Pace has acquired a net worth of over $30 million, as of early 2017, amassed largely during his football career of 12 years. Pace grew up in Sandusky along with his sister, raised by his mother and grandmother, and attended Sandusky High School, where he was a two-sport athlete starring in football and basketball, being selected first-team high school All-American by Parade and USA Today. He then enrolled at Ohio State University, majoring in Business. He played for the school’s football team, the Ohio State Buckeyes, from 1994 to 1996, during which he was a two-time Consensus All-American, winning the Lombardi Award for the best college lineman or linebacker in 1995 and 1996, the only player to receive the award two times. He also won the Outland Trophy in 1996 for the best college football interior lineman, being one of only twelve players to capture both the Outland Trophy and the Lombardi Award. He finished 4th in balloting for collegiate football’s highest honor, the Heisman trophy, in 1996, which was an extraordinary achievement for an offensive lineman. 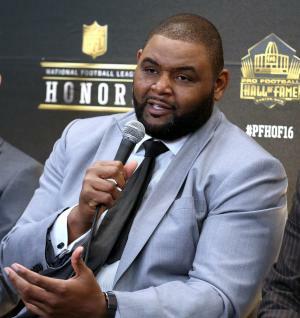 Pace was selected as the first overall pick in the 1997 NFL Draft by the St. Louis Rams, becoming only the fourth offensive tackle in the draft’s history to be selected as number one. After turning down the team’s seven-year, $23.1 million contract offer, he landed the most lucrative deal for a rookie in NFL history – a seven-year, $29.4 million deal plus a $6.3 million signing bonus. His net worth was certainly well established boosted. Pace went on to spend 12 of his total 13 seasons with the Rams, becoming one of the most dominating offensive tackles in the history of football. In 1999 he was elected to his first Pro Bowl, and was also a First-team All-Pro, unsurprising since the Rams won the Super Bowl. He was elected to the ProBowl the following three seasons as well. In 2003 he signed a one-year, $5.7 million contract as the team’s franchise player, improving his wealth in a great way. He earned his fifth consecutive Pro Bowl selection that year. The following year he signed a one-year, $7.02 million tender with the Rams as a franchise player, which enabled him to gain the average salary of the five highest-paid offensive linemen in the NFL. All contributed to his net worth. Another Pro Bowl selection followed. The franchise tag happened in 2005 as well, providing Pace with a seven-year, $52.9 million contract, including $18 million in first-year salary and bonus, which significantly added to his fortune once again. He earned his seventh consecutive Pro Bowl invitation that year. Pace’s last few seasons with the Rams were plagued with injuries and he was released by the team in 2009. The same year he signed a three-year, $15 million deal with the Chicago Bears. However, shortly after he suffered an injury which put him on the reserve list. The team released him the following year and Pace retired from professional football. During his 13-year career in the NFL, Pace achieved five All-Pro and seven consecutive Pro Bowl selections. He has been considered as one of the best offensive linemen of his era, which has enabled him to establish a great popularity and considerable wealth. In his personal life, Pace is married to Carla. Sources believe the couple has four children together. 1 Inducted into the Pro Football Hall of Fame in 2016. 3 Offensive tackle #1 overall pick by the St. Louis Rams in the 1997 NFL draft out of Ohio State. 7-time Pro Bowler.